- Aaron Braun talking after his win at the Go! St. Louis Half-Marathon this past Sunday where he won in a course record 1:03:13 and picked up his biggest ever payday of $10,000. 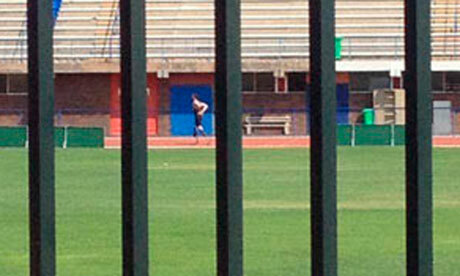 if Nick Symmonds were to run the 5000, what would his time be on a good day? Leo Manzano 14:57 at Carlsbad - are you joking? I'm a male. I out-kicked a female at the end of a race. Am I evil? Why do pants tend to be worn higher with age? if there was a world war with NO weapons, who would win?? Russian Athletics Chief Says He Expects More Russian Doping Cases To Be Revealed Valentin Balakhnichyov said he expected more doping cases with Russian athletes to be revealed in the future saying it's because the country conducted more drugs tests than any other nation. He says, "It's simple arithmetic." However, more testing today wouldn't account for the dopers who have been caught from 2005 re-tests. *MB: 17 POSITIVE TESTS FROM ENDURANCE ATHLETES!!. (not released by the IAAF yet) Make your bets here! Russia Athletics President Balakhnichev Defends Russia And Tells British Coaches They "better watch closely what's going on closer to home." Much of the criticism against Russia has come from British officials/athletes, including UK Athletics' head coach Peter Eriksson and a LJer who said Moscow should lose the World Championships. Athletics Kenya Say They Are "Concerned" About Increased Kenyan Doping And that The Government Has Invested "A Lot Of Money" Into An Investigative Committee 13 have tested positive in the last year. Marion Jones To Speak At UNC About "Her Story Of Olympic Glory And Subsequent Personal Redemption" The description makes her out to be a saint rather than fraud talking of her "confession" and "voluntarily returned her five Olympic medals." RR: Former US Paralympic Head Track Coach Works With Wounded Veterans Teaching Them How To Run/Walk Again On Prosthetics Good article on how running helps wounded veterans recover both mentally and physically. Includes a story of a former 47 second 400 runner who lost his legs and has now ran a marathon. Mo Farah's Wife Okay After Drunk Driver Smashes Into Her Car Farah tweeted, "Drunk driver smashed in back of my wife's car..!! And then run off..!! Wish I was there to chase them..!!!" Berlin Half: Kenya's Jacob Kendagor Wins Berlin Half Marathon In 59:36 With Silas Kipruto 2nd (1:00:12) And Victor Kipchirchir 3rd (1:00:27) Helah Kiprop won the women's race in 1:07:53 over Philes Ongori (1:08:01). *JapanRunning News Looks At Japan Distance Runners' Weekend Road Performances Mai Ito was 3rd at the Berlin Half in 1:10:00 as a tune-up for the London Marathon in 2 weeks. *24-Year-Old Man Died During Berlin Half The amateur runner collapsed shortly before the finish line and died later in the hospital. Cooper River Bridge Run 10K: Kenya's Simon Ndirangu Wins In 28:05 With Julius Kogo (28:49) And Bobby Mack (28:50) A Distant 2nd And 3rd In the women's race, World XC 2nd placer Hiwott Ayalew won in 32:18, beating Ogla Kimaiyo by 2 seconds. More From Prague Half (See Full Coverage Below): Good Read: After A Long Time Away, Kenya's 2004 Olympic Silver Medalist Isabella Ochichi Returns To Competition At The Prague Half Marathon With A 69:21 For 3rd (updated with audio interview) "In 2011, I can remember thinking that I needed to go back to competitive running even though the doctors said no. I felt my body smiling and I knew I had to try. I love running." Other: 91-Year-Old Sets World Half Marathon Record At 3 Hours, 3 Minutes And 56 Seconds Apparently there was no previous record. Hervis Prague Half: Zersenay Tadese Settles For Sprint Victory - Gladys Cherono Steals Show And Becomes 12th-Fastest Woman In History At 66:48 A €100,000 WR bonus was no match for Mother Nature as cold and wintry conditions kept the pace slow from the start and Tadese was feeling ill.
*Pre-Race: After Excelling In "End Of Road" Fartlek Workout, Philemon Limo Feels As If He's Ready This article talks about the "End of the Road" fartlek, which LetsRun witnessed in 2011 where 400+ Kenyans are narrowed down to a handful. *The Australian: Spearmon Wins 200 - Says He May Move Uo To 400 This Year At MJ's Request "Michael Johnson says I can run the 400, my Dad, my family, so I might as well try it," said Spearmon, who won the 200 (20.79 into a 1.3 wind) but couldn't come back and win the 100, as he was 4th in 10.29. Friday: Eunice Sum Beats 2008 Olympic Champ Nancy Langat In 1,500 In Kenya Langat is the poster child of competing versus times as she's never broken 4:00. No Hall, No Meb, No Mosop - Who's Left? USTFCCCA NCAA Performances Of The Week Go To Georgia Tech 800 Runner Brandon Lasater And UCF Sprinter Octavious Freeman (Includes Video) Two weeks ago Lasater's PR was only 1:53.63, but now he's a consistent 1:48 guy, PRing with a 1:48.34 in the open 800 at Florida Relays and then anchoring the Georgia Tech 4x8 to a narrow victory with a 1:48.30 split and exciting kick. Freeman set a World lead in the 100 with 11.02. Columbia University Alum Lisa Stublic Wins Zurich Marathon In A New Croatian National Record Of 2:25:44 She took more than five minutes off her own previous record of 2:30:46. Outdoor Season Has Just Got Going, But WR Holder Ashton Eaton Has Already PR'd In 3 Events The latest was a 45.64 in the 400, but he's also set PR's in the shot with 50 feet 6 1/4 and javelin with 218-8. New Bill In California Would Call For Student Athletes To Get Stipends From Media Rights And Licensing Fees The law would actually only affect UCLA and UC Berkeley as it'd be applied to public schools "that earn at least $20 million per year in licensing fees for various products, such as replica jerseys or appearances in video games." NY Times: "NCAA Needs Overhauling At The Top" Analyzes the pros and cons about a system that makes athletics more important than academics, but gives student athletes a chance to get an education at a university they would never be able to afford. Want To Run In The World Championships Marathon? Well Starting In 2015 You Can According to the IAAF Council Meeting Notes from this weekend, starting at the 2015 Beijing World Championships, "Mass participation races for men and women to be held at the same time of the World Championships marathon races." IOC Considering Extra Events For Rio 2016 Games Two being considered are 3-on-3 basketball and BMX freestyle. Greek Athletic Federation Wins Protest Against Proposal For 80% Cut In State Funding They're happy about the government's change of heart, but they'll still receive a 30% budget cut. 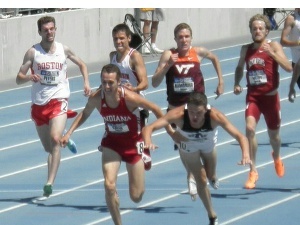 Many US Collegians Populate Track & Field News USATF Form Chart 73 total. International: University Of Technology Win Women's Jamaican Intercollegiate Track And Field Champs At the time of this article, the men's competition wasn't yet completed, but the University of the West Indies was leading. Japan's Outdoor Season Got Going Yesterday With Kanaguri Memorial Meet: Japan-Based Africans Win All Major Races Patrick Mutunga won the 5,000 in 13:26.48. Always A Class Act: Jamaican Paper Q&A With Tyson Gay, Whom They Refer To As Their "Most Liked Non-Jamaican Track And Field Athlete" Asked if he thought the Jamaica vs. USA sprint rivalry is good for track, he said, "Yes and no. Rivalries are always good no matter the sport. ... but the sport is more than just USA vs. Jamaica. I like the focus on sprinting but there are other events too. 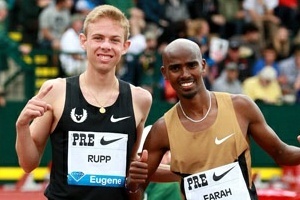 Those distance people and field eventers need to get some love from the media too." 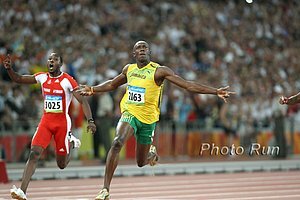 Random But Interesting: Would Usain Bolt Run More Slowly With The Name Usain Plod? Some psychiatrists say that our names actually are a powerful force in shaping our lives. Paris Marathon Organizers Will Lay Energy-Harvesting Tiles Across The Course On Sunday So 40,000 Runners Will Create Energy If we are reading this right, they're hoping to get enough to power a single lightbulb for 5 days - and it costs how much? RunnersTribe Interview With Aussie Olympian And Stanford Sprinter Steve Solomon He says he loves it at Stanford and talks about making the decision to go to Stanford rather than go pro. UK Runners Release First Hands-Free Hydration System An armband with a built-in water bottle that holds 6.7 ounces of liquid. 14 Year Old Winter Vinecki Is Youngest Ever To Finish A Marathon On Antarctica She's running a marathon on all seven continents in honor of her deceased father. She ran 4:49:45 for 3rd place. Shameful: Disgraced Hungarian Discus Thrower Robert Fazekas Sues Canadian Supplement Company, Blaming Them For Positive Test That Kicked Him Out Of London 2012 Previously, Fazeka was stripped of his 2004 gold medal for not giving enough of a urine sample, claiming he was "deeply religious" and "had difficulty urinating in front of other people." His coach Adrian Annus, who is also part of the lawsuit, was also stripped of the gold medal he previously won when his urine samples showed evidence of belonging to different people. What a team. LRC Flanagan Shows Her Cards, Alisha Williams Continues Her Climb To The Top, Kara Goucher And FGCU, And More Shalane Flanagan showed she's ready for the Boston marathon while Kara Goucher keeps improving. We ponder who has improved the most - Alisha Williams or Chelsea Reilly. Plus LRC educating journalists in Africa.